Manny "The Pacman" Pacquiao (left) beats the "Grand Master" Joshua Clottey by unanimous decision and gives the Ghanaian fighter a lesson in boxing he won't soon forget. 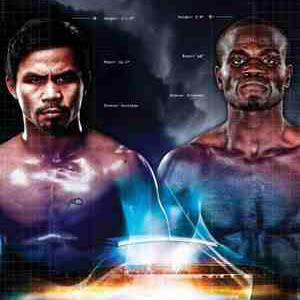 March 13, 2010, Arlington, Texas, U.S.A.— Today, pound-for-pound boxing champion Manny Pacquiao will engage Ghanaian fighter Joshua Clottey to defend his World Boxing Organization World Welterweight title. Dubbed the "The Event," the fighters will go head to head before 51,000 live spectators inside the Cowboys Stadium, and millions more international viewers will follow the fight through TV, radio and the Internet. MATCHUP. Manny, nicknamed "Pac-Man," boasts 50 wins (50 wins-3 losses-2 draws), including his recently won WBO Welterweight title from Puerto Rican Miguel Cotto in November 2009. The 31-year old southpaw (lefty) specialist from Bukidnon, Philippines has also raked in 38 wins by knockout in his entire career. Manny is also the first boxer in history to win seven world titles in seven different weight divisions. He stands 5'6" and has a reach of 67". Speed and a mean left hook are usually Manny's main weapons but he has since upgraded his arsenal with decent power and the ability to deliver staggering blows with his right fist. Joshua Clottey hails from Accra, Ghana. The 32-year-old boxer has earned 35 wins (35 wins-3 losses-1 draw) in his career via his hard-hitting right hand. The "Grand Master" Joshua enjoys a 2-3 inch advantage over Manny in terms of height (5'8") and reach (70"). The Ghanaian relies on pure power alone, offensively, and has top defensive skills to boot. LET'S GET READY TO RUMBLE! Singing the National Anthem for the Philippines is Journey frontman Arnel Pineda. Rafael Ramos will referee the fight. Joshua—wearing red and gray trunks—comes in dancing an African dance, while Manny—wearing red trunks—comes in later with just a smile on his face. Crowd favorite Manny gets a thunderous roar of approval from the people cheering in the stadium after announcer Michael Buffer introduces him. Round 1. Joshua starts off with a left. Manny shrugs it off and closes in with a combination of punches. He is testing Joshua's defenses. Manny gives a four-punch combination but it fails to penetrate Joshua. Joshua takes revenge by giving a right to Manny but to no effect. Manny answers but the defense of Joshua remains hard. Both fighters are now at the center and Manny gives a right to the body which makes Joshua stagger a little. Manny once again closes in with a body punch but does not connect. Joshua retaliates with a body punch but it makes little difference to Manny. Joshua tries to tire out Manny and Manny just goes all out with a combination seconds before time runs out. Round 2. Manny gives little punches and a left to Joshua but does little again to damage him. Both are testing each other out defensively. Manny again goes on the offensive with two jabs but Joshua remains in defensive mode. Manny gives a straight to the body once again but it does nothing. Manny continues with the jabbing to the body and Joshua taunts Manny with a dance. Joshua gives an uppercut but misses. Joshua connects a straight to Manny but it brushes just above the brow. Manny answers back with a body shot. A left straight once again from Manny ends the round. Round 3. Manny gives a combination and Joshua gives the same but both do little damage. Manny is just patient throughout and continues to test Joshua's defenses. Manny gives a left that shakes up Joshua's defense. This time, Manny gives an uppercut but nothing happens. Joshua gets lucky with a right straight to Manny but Manny shakes it off. An uppercut and a straight shake Manny's defenses and Joshua continues to bash Manny's defense. Manny answers back with a flurry of uppercuts. Round 4. The round starts with Joshua on the offensive. Manny gives a jab and a straight to Joshua and Joshua answers with his own jabs. Joshua once again is in defensive mode while Manny closes in with body shots and concentrates with punches to the body only. Joshua gives Manny some jabs but they do little. Manny circles to find an opening and gives an uppercut to the head. Joshua retreats and retaliates with some more timed punches. Manny and his right jabs and left straights are not enough as the bell sounds and the round ends. Round 5. Joshua is still on the defensive as the match starts. He gives Manny some small punches but these only infuriate Manny who answers back with a one-two combination punch. Two jabs from Joshua connect but Manny quickly recovers. Manny is now on the ropes as Joshua releases some major punches. Manny defends and punches back to Joshua's body. Joshua just gives Manny one to two punches while Manny gives a combination of four punches! The round ends with Joshua just defending. Round 6. This one starts with Manny going on the offensive. Joshua still is not aggressive but gives Manny four punches. Manny asks for more and answers back with his own jabs. Manny is still looking for an opening but Joshua remains on defense. Now in the middle, Joshua gives a combination that does almost nothing to Manny. Manny continues with the left hooks but Joshua remains with his hands up in defense. Round 7. Round starts with Manny looking refreshed and Joshua this time initiates the first punch. Manny answers with mosquito punches. Manny gives Joshua a hit to the head and two to the body but Joshua's defense is still rock solid. Joshua gives a hard straight but just ends up as nothing to Manny. The two proceed with Joshua giving an uppercut and Manny answering with body shots. Joshua again releases but Manny defends. He circles around but Joshua is just closed right now. Round 8. Manny initiates and Joshua, as usual, closes himself with his defense. The two trade some jabs and Manny opens up his defense to taunt Joshua and after that proceeds to bodypunch Joshua. Joshua gives a below-the-belt punch to Manny. Manny is fine and the two proceed with an exchange of combinations. Manny homes his punches to Joshua's body but Joshua again goes on the defensive. Round 9. Bells sounds off with Joshua AGAIN doing what he does best—defending. Manny goes berserk with a flurry of jabs but ends up with nothing. Manny once again goes for the body with some jabs and one jab to the head. Joshua answers with a four-punch combination and Manny defends. Joshua is slowly lowering his defenses and Manny gives a three-punch combination that homes in successfully. Round 10. Things are starting to heat up with Manny giving Joshua a good straight. Both are on the defensive but Manny breaks with mosquito punches. Three straights from Manny confuses Joshua but he regains composure when he gives Manny a good right cross to the body but again switches to defense mode. Manny gives a combination and an uppercut but these land flat on Joshua's defense. Manny by this time is pumped up by the crowd's cheering and goes all out with body shots to Joshua. Round 11. The second to the last round starts with Joshua defending again. Manny gives two crosses to Joshua and he backs away. Manny unleashes with a flurry and Joshua answers back with little or no punches. Manny circles and Joshua gives two uppercuts and nothing more. Manny goes for the body and does not stop with the combinations. Joshua is trapped to the ropes and Manny continues with his fury on Joshua's defense. Nine punches from Manny with occassional head shots home in on Joshua. Saved by the bell, Joshua retreats to his corner, exhausted. Round 12. This is it. Joshua will either go all out offensively or once again defend himself from Manny's punches. As expected, he gives a few punches to Manny and Manny answers with mosquito and combination punches. Manny jabs and jabs but the closed Joshua is still defending. He answers with two jabs but that's it. Manny gets an uppercut from Joshua but it is followed with no more. Manny and Joshua go nearly all out, and Manny fails in his attempt to finish Joshua off with the bells signalling the end of the fight.